Createspace Independent Publishing Platform, 9781499106862, 142pp. "Be strong. Be bold. Become all that you are meant to be." At eleven years old, Michelle Wulfestieg experiences a devastating stroke. Through the eyes of a child, she receives the diagnosis of an inoperable lesion in her brain that will cause painful radiation treatments and permanent paralysis of her right side, only to be informed that the pulsating tangle of blood vessels will cause her untimely death. Determined to move forward, she embarks on a journey of self-discovery that will redefine her identity, as she learns to cope with a disability and a limited life expectancy. Then, through a second catastrophic stroke, she is transported to the Place of Prayers where a miraculous healing takes place, revealing God's true purpose for her life. "When it seems as though there is no hope, prayer is about invading the impossible. 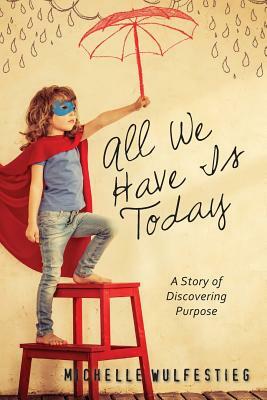 This book is a powerful testimony of how God is the Almighty Healer, capable of restoring the mind, body, and spirit so that we may discover his true purpose for our lives." -Jack Hayford, bestselling author and former president of Foursquare Church International. "This book inspires us to think beyond what is possible, that there is a reason for everything, and that the veil between life and death is much thinner than we think-and that we should be thinking about that much more than we are." -Nick Gilhool, executive casting director of the hit Showtime documentary series, "Time of Death. With the heart of a servant-leader, Michelle Wulfestieg has worked in the field of hospice for over ten years, where she assists terminally ill patients daily. As a two-time stroke survivor, she understands just how precious life is and believes that as long as you are here, you have a purpose. You can learn more about Michelle by visiting www.AllWeHaveIsToday.com.